Republicans for Honesty in Government is headquartered in the offices of Robert Johnson, a Minnesota businessman. Federal Election Commission records show that a “Robert P. Johnson,” “Robert Johnson” or “Bob Johnson” at “AEI Fund Management” or related company names in Minnesota has donated a total of $43,830.50 in federal campaign funding since 2004. All of it went to DFL and Democratic candidates or political-action committees. Johnson told the Minnesota news web site GoMN that he had leaned towards the Republican party in the past, but switched allegiances after what the website described as a shift to the right within the GOP. 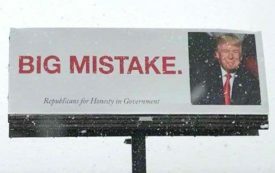 One billboard on Route 52 in Minnesota.